Rohingya refugees climb a truck to receive aid distributed by local organisations at Balukhali makeshift refugee camp in Cox's Bazar, Bangladesh, September 14, 2017. 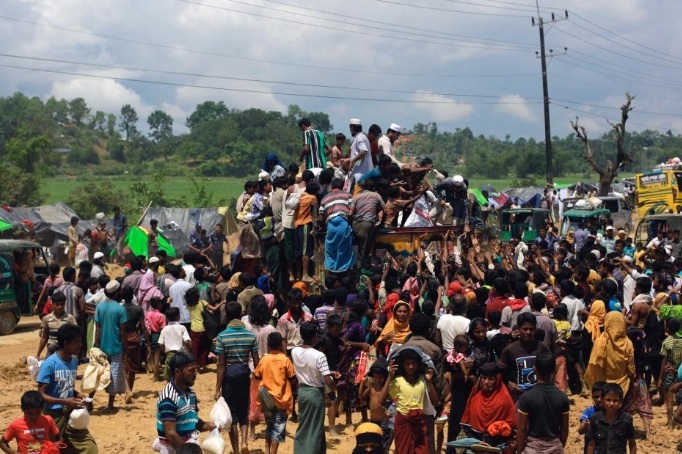 DHAKA/YANGON - The United Nations appealed on Thursday for massive help for nearly 400,000 Muslims from Myanmar who have fled to Bangladesh, with concern growing that the number could keep rising, unless Myanmar ends what critics denounce as “ethnic cleansing”. The Rohingya are fleeing from a Myanmar military offensive in the western state of Rakhine that was triggered by a series of guerrilla attacks on Aug. 25 on security posts and an army camp in which about a dozen people were killed. The United Nations has called for a massive intensification of relief operations to help the refugees, and a much bigger response from the international community. “We urge the international community to step up humanitarian support and come up with help,” Mohammed Abdiker, director of operations and emergencies for the International Organisation for Migration, told a news conference in the Bangladeshi capital. The need was “massive”, he added. The government of Buddhist-majority Myanmar rejects such accusations, saying it is targeting “terrorists”. Numerous Rohingya villages in the north of Rakhine have been torched but authorities have denied that security forces or Buddhist civilians set the fires. They blame the insurgents, and say 30,000 non-Muslim villagers were also displaced. Smoke was rising from at least five places on the Myanmar side of the border on Thursday, a Reuters reporter in Bangladesh said. It was not clear what was burning or who set the fires. “Ethnic cleansing” is not recognized as an independent crime under international law, the U.N. Office on Genocide Prevention says, but it has been used in U.N. resolutions and acknowledged in judgments and indictments of the International Criminal Tribunal for the former Yugoslavia. A U.N. panel of experts defined it as “rendering an area ethnically homogeneous by using force or intimidation to remove persons of given groups”. The crisis has raised questions about Suu Kyi’s commitment to human rights, and could strain relations with Western backers supporting her leadership of Myanmar’s transition from decades of strict military rule and economic isolation. Critics have called for her to be stripped of her Nobel prize for failing to do more to halt the strife, though national security remains firmly in the hands of the military. China, which competes with the United States for influence in Myanmar, endorses the offensive against the insurgents and deemed it an “internal affair”, Myanmar state media said. “The counterattacks of Myanmar security forces against extremist terrorists and the government’s undertakings to provide assistance to the people are strongly welcomed,” the Global New Light of Myanmar newspaper quoted China’s ambassador, Hong Liang, as telling government officials. But at the United Nations in New York, China set a different tone, joining a Security Council expression of concern about reports of violence and urging steps to end it. The Security Council met on Wednesday to discuss the crisis and later “expressed concern about reports of excessive violence ... and called for immediate steps to end the violence in Rakhine, de-escalate the situation, re-establish law and order, ensure the protection of civilians ... and resolve the refugee problem”. This week, the Trump administration called for protection of civilians. Bangladesh says the refugees will have to go home and has called for safe zones in Myanmar. Myanmar says safe zones are unacceptable. The IOM’s Abdiker declined to say how many refugees he thought might end up in Bangladesh. “The number may rise to 600,000, 700,000, even one million if the situation in Myanmar does not improve,” he said. The most important thing was that the refugees be able to go home safely, said George William Okoth-Obbo, assistant high commissioner for operations at the U.N. refugee agency. “The international community has to support to ensure their return ... peacefully and with safety,” he told the news conference. On Wednesday, the Myanmar government said 45 places had been burned. It did not provide details, but a spokesman said out of 471 villages in the north of Rakhine, 176 had been deserted and at least some people had left 34 more. Government figures show 432 people have been killed, most of them insurgents, since Aug. 25.